The number one hazard for children is falls, which are the leading cause of non-fatal injuries in the U.S. for this age group. About 8,000 youngsters wind up in emergency rooms every day for injuries related to falling, adding up to almost 2.8 million per year. With those statistics in mind, it is worth looking at what can be done to prevent such injuries in the home. In trying to fathom how so many children can be injured on a daily basis from something as simple as slipping and falling, we need to consider an important factor, which is height. Oftentimes, when observing small children at play, we are amazed at their dexterity and ability to take what looks like a fairly serious tumble and hop right back up, unfazed. Likewise, a slip or fall for most adults, more often than not, leads to little more than a poorly chosen expletive being uttered. However, imagine a small child falling a distance equivalent to the average height of an adult, and we begin to see where the danger lies. With this to consider, let’s closer look at two of the most important areas to childproof in a home: windows and staircases. The first thing that probably comes to mind when examining child safety in relation to stairways and staircases is a safety gate, and with good reason: falling down stairs can be a serious hazard for an infant or toddler who is just learning to navigate his or her surroundings. When properly installed, high-quality safety gates can help eliminate this possibility. A safety gate is a gate that is temporarily installed in a door or stairway. It allows adults to unlock and pass, but small children will be unable to open it. There are two basic types of gates which differ in the way they are installed. The first type is a pressure-mounted gate. These safety gates are fixed in place by pressure against walls or a doorway. They can be used in doorways between rooms, such as for keeping crawling babies out of a kitchen during cooking, but they are not suitable for keeping kids out of other areas, such as the top of a stairway, where falling could be a risk. The other type of safety gate, which is recommended specifically for stairways, is hardware-mounted. These gates will mount solidly in place with screws but are still easily removable for times when they are unnecessary. 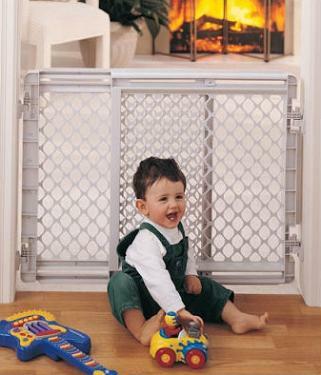 A hardware-mounted safety gate will prevent small children from entering stairways where accidents could occur. When choosing a safety gate, you can refer to established ASTM standards for these products, and some manufacturers also participate in a certification program administered by the Juvenile Products Manufacturers Association. Any gate you choose should meet the ASTM standards, which will ensure that the gate itself poses no hazard to the child. Products that comply with these standards will have a sticker on the packaging or on the unit itself. For parents of children who have outgrown the need for safety gates but are still small and curious, especially those prone to climbing on things, baluster spacing on the handrail becomes a concern. 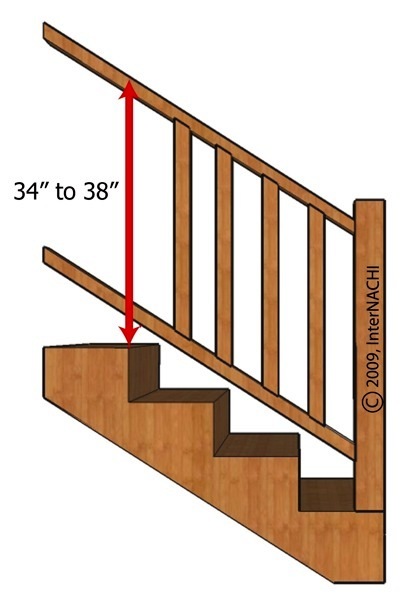 An InterNACHI inspector knows that a stairway with four or more risers should have a continuous handrail not lower than 34 inches or taller than 38 inches on at least one side, with balustrades not more than 4 inches apart from each other. If you have spaces between vertical rails or risers that will allow an object larger than 4 inches to pass between them, they should be reported during an inspection as in need of repair because they pose a risk to a child who tries to climb on the rail or gets stuck between them. The first thing and simplest thing to do is to ensure that there is no furniture situated in areas that would make it easy for a child to reach and open or close a window. Any furniture a child could potentially climb on should be moved away from windows. As children begin to grow to heights where they may be able to access windows from a standing position, it is important to install secure, child-proof latches. There are many types of window latches that, similar to safety gates, will allow an adult to easily open and close windows, but will prevent kids from doing the same. Also available are window stops, which will not allow the window to be opened wider than a pre-determined width. The recommended opening, similar to balustrade spacing, should not exceed 4 inches. This eliminates the possibility of a child or one of his limbs to pass through. These stops are easily removable by an adult whenever necessary. An additional option to consider is a window guard. A window guard can be vertical or horizontal. It attaches to a frame and can be removed by an adult, but will deter a child. 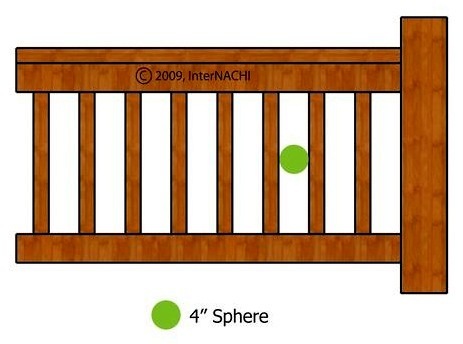 Guards have some form of bars or beams across them, which should be no more than 4 inches apart. Window guards maintain the functionality of the window while ensuring a child’s safety while the window is open. However, even with a guard installed, kids should not be allowed to play around windows, whether they are open or closed. Try to open windows only from the top, if possible. 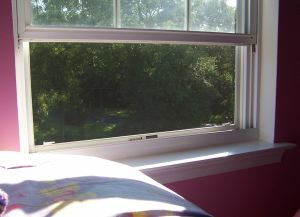 And never rely on window screens to keep a child from falling, as that is not the function they are designed for. With some foresight, a few clever and fairly inexpensive products, and proper adherence to building codes, the risk of injury from falling can be successfully minimized. Your InterNACHI inspector can assess the safety issues in your home, and advise you on the most effective childproofing measures to keep your family safe.